Ask the Readers: What's in Your Wallet? Ask the Readers: What’s in Your Wallet? The personal finance blog group, The Money Writers, came up with the idea of writing a post about the contents of a blogger’s wallet. As it’s a regular occurrence for me to bare all (financially) on this blog, I agreed to play along as some of my readers may be curious as well. What’s my philosophy on what I carry in my wallet? I try to keep things as minimalistic as possible, but as a fan of rewards points, it can lead to more than a few cards in the wallet. The Wallet – Starting at the very top, you’ll see my 12 year old wallet that has seen better days. What else did you expect from a frugal guy? Credit Cards – At the top left, you’ll see my main credit card – The MBNA Smart Cash credit card. This is a no annual fee card and is my pick for the top cash back credit card in Canada. This card will give you 2% cash back on gas and groceries, up to $400 in spending per month and 1% on everything else. Next to that you’ll see the American Express SPG credit card. You may be thinking, what is a fee based card doing there? I signed up for this SPG card as I’m already committed to the program from collecting points via the canceled MBNA SPG Mastercard. The first year annual fee was waived with the AMEX, so I figured it would extend my points by another year as points get lost after one year of inactivity. I’ll likely cancel the card before they charge me for the next year. Update April 2013 – We’ve cancelled our SPG AMEX and added the Capital One Aspire Cash World card to complement the Smart Cash Card. We use the Smart Cash for gas/groceries up to the monthly 2% limit, then use the Capital One card for everything else (1.5% cash back). Here is a thorough Capital One Aspire Cash World Review (now discontinued). Update Sept 2013 – The Capital One Aspire Cash World has been discontinued. You can see my picks for the next best cash back credit card here. Rewards Programs – To the right of the AMEX, you’ll see my Esso Extra card. I tend to stick with the same gas station which I’ve read is good for the car, and also good on the points. I use the Esso points mostly for free car washes. Other rewards programs that I follow are Airmiles and on occasion, we share a Subway sandwich if we are on the run. Bank Cards – I used to carry two bank cards, but have reduced to only carrying my CIBC card as I rarely use the bank machine for my PC financial account. I’ve been doing my banking with CIBC for years, thus the black convenience card. Other Cards – In my “misc” cards pile, there’s my Costco Executive Membership, my drivers license, insurance, and, of course, a library card. Since we’ve been doing a lot of our shopping at Costco, the upgrade to the Executive membership made sense as it pays for itself with 2% cash back. The library card also gets quite a bit of use as it’s a fun destination for the kids. Cash – Hard to believe but I didn’t know how much cash was in my wallet until I took everything out. I like to have a few $20’s around in case cash is needed which is actually quite rare. I tend to use a credit card for everything possible. 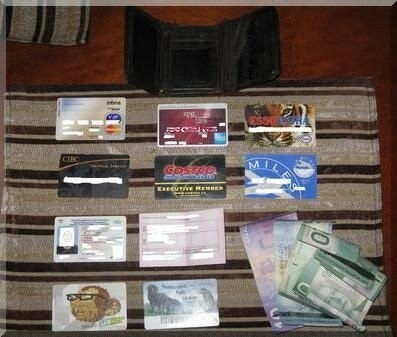 How do the contents of my wallet compare with yours? Cash! and a few debit cards. I quit using credit cards been about 6 months. I do have a Global Payment Mastercard which acts and uses the credit card system but is actually tied to a bank account. And you can use your MasterCard at Tim Hortons!!! But if you like cash back cards, you’re a Costco member, and you like Amex then replace three cards with one by putting your Costco membership on the back of your Amex card and get cash back where-ever you use it!!! SmartCash is good for 3% cashback on groceries & gas, Ultramar is a flat 1.25% cashback everywhere (also pay all utilities, phones, insurance, etc on it). I use the Airmiles Amex at Costco only because I don’t spend enough at Costco annually to make the tiered cashback Amex worth it. No cash (usually), one credit card, one debit card (just in case, I don’t use it much), a library card and a drivers licence. I also have pictures of my family, a business card, a cheque and a bus ticket (again, in case). That’s it.Membership cards stay in the car. Costco card – waste of money. If I absolutely need something there, I borrow the company’s card. I have 4 cards in my wallet – license, library, MBNA Smart Cash, debit card. Second cup card – gotta have coffee – get free latte on load and pay with Visa so decent return. Like Robert, the points cards in the car (Airmiles, Aeroplan, Sobey’s, Shopper Optimum are the main ones). I will be removing a few of the membership cards but I like to have them on hand as needed. Citibank Drivers Edge Mastercard – $8 annual fee 2% on everything to a max of $1000 annually redeemable on any car purchase. I have been leasing for a while so this makes sense for me as I redeem for 3k every 3 years. TD Rebate Rewards Visa – not great but just got for overflow when I max out my mastercard benefits. 11 – Care Card – should this be carried in our wallets? also, a few receipts, some cash, some superstore gas bucks, some family pics and some business cards. I should probably leave the AMEX card at home. I likely don’t need to carry around my firearms permit, Safeway and Air Miles cards could technically be left in the car, but I would likely regularly forget to take them into the store with me. Plus we have two vehicles, so it could be hard to remember to get them from one or the other every time one goes shopping. Same goes for the BCAA card and dilemma of which vehicle to store it in. Should care card be carried? Don’t forget that rather than carry around all your loyalty cards you can just write the numbers all down on a piece of paper, most places can enter the numbers manually if it isn’t already tied to your phone number. Only problem would be gas stations, as I tend to swipe mine at the pump. If you have an iPhone then get CardStar, an app that displays the bar code from any of your rewards cards, such that it can be scanned at the cash. The rest I now keep in my safe and get them when needed. All nicely tucked away in a 15 year old wallet that is shaped perfectly to the inside of my pocket (no, my dear wifey, for the last time, I’m *not* getting a new one). I do not carry a wallet, only a money clip. In the clip is my driver’s license, bank card, and cash. an equally important question is where do you carry your wallet? I am right rear pocket, though my father who is also right handed, keeps it in the left rear. I also have an Uncle and Grandfather who carried it in the front right pocket (fear of pickpockets?). My uncle’s used to be George Costanza thick too. I prefer cashback but I have various reward club #s conveniently saved on my iPhone. Apart from the standard credit card/ID/debit card/cash/library card I also have my health card, my card for getting into the office, pics of my husband and my dog, a phonecard in case I need to call Ireland, work-related receipts for expenses, a bunch of business cards, gym membership card, my TTC (transit) pass and spare hair ties. I carry a lot of crap around, but I’m a girl, I have a bag for my bulging wallet. Anyway you can sign up on their website for the speed pass. It’s mailed to you and I think you even get a few hundred bonus points for signing up. I’ve been following you for a year or so… and go figure, I have the exact same cards as you in my wallet. Right down to the same amount of cash, too. @chuckles, i used to carry my wallet in my back pocket, then I read that it’s not so great for the back, so I either put it in my jacket pocket or front pocket. @Ray, that is a coincidence! I’m not surprised that a lot of MDJ readers use the smart cash card as it’s likely the top cash back CC in Canada. Paper with numbers for Air Miles, Aeroplan, Alberta Heath care, GWL health plan, and some airline club membership numbers. This is what I typically carry, but sometimes there’s a gift card or Tim Horton’s cup rim (if I won a free coffee or donut). All this fits in a nice leather wallet that I’ve had for 10 years and is still in really good shape. It measures 2cm thick (filled with the above), so I prefer not to keep it in my pants pocket (besides, I’m sure I’d always forget it when I put on new pants each day). Instead, I keep it in my jacket, in either a zippered outer chest pocket or an interior pocket. I usually keep my buspass with it, but not inside it. @ Chuck: Sciatica can be a pain. Keep in mind that cutting down on cards is a great idea. Also consider reducing wallet thickness or putting it into your front pocket to sit on less. For people looking to upgrade wallets: Rogue Wallets are designed to fit into front pockets, but are for the severe minimalist. BigSkinnys and AllEtts are designed to be super-thin while carrying a whole bunch of cards. Check them out on the websites. I use a leather Big Skinny wallet, and it’s nice and flat (compared to my old canvas one) but can fit double of what I carry. I’m thinking of converting to a money clip, but am not sure which one to go for. On a side note, walletstock.com offers minimalist skinny wallets for us Canadians, without the need to pay huge money for shipping and customs. A drivers license and medical card. I was thinking about adding my teaching card for potential discounts. Thanks for the posting idea, I think I will write one on this topic. Great and interesting post FT !! Change your CIBC regular IS card to an Advantage IS card. JFG, what are the benefits of the “advantage” card? Not to sound like a sales pitch. You can use the Visa network to make purchases (on line, telephone banking, shopping in the US), and it debits your account. In Canada, it works as a debit. Plus, CIBC is having a draw for a whole lot of Aeroplan points ( 1 Million Miles actually). Since you are IS, talk to your advisor. Look, I work there, but just the chance to win 1 Million miles….. And no, I can’t win since I am an employee. How long do you have to be with CIBC for to get a black card? It’s not a matter of time, it is if you want to work with an FA and you have the assets. With more unique gift cards, we need carry each one everywhere we go. For gas, toysrus, tesco, fashion boutique, hair saloon, etc. Luckily I have a long purse that can hold all these cards with 5 more bank cards. Not including license, IC, photos, money, etc. Sometimes, it takes the whole day to clean up the purse. So, I would rather do it on weekend. I recently bought a new lady-like and grown-up wallet. It has quite a few pockets so I’m carrying all manner of things with me. It doesn’t bulge and everything fits nicely. Some people should really just print or stick the barcodes of their bonus cards onto a cardboard one. Or understand that there’s no need to carry around family photos and museum cards that are not needed for the moment. I have $100 in bills and about $10-12 in change in my wallet. I don’t drive and my husband has the costco card. @marina: Get your SIN card and Birth Certificate out of your wallet! There’s no reason to carry those anywhere. The more people continue to use credit cards and not cash, the more we are headed to a cash-obsolete society. We are giving up our right to privacy and allowing the government (and other institutions) to trace every expenditure AND every move we make (when purchasing). Not the kind of world I care to live in. Previous post: Ally Canada’s Future, Cheap Halloween Treats, Employee Theft and More!